Yesterday we began moving westwards into the highlands of Belize. 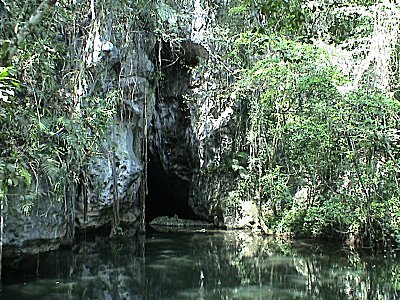 Waterfalls, caves, and Mayan ruins hide in the mountains. Other dangers lurk here. We learn that in Belize, many mosquitoes carry the eggs of the botfly. The mosquito lays the eggs in the skin and the botfly larvae grows inside. It looks like an infected mosquito bite. The way to remove the larva is to suffocate it with tape. After it has incubated in your skin for a few weeks, place tape over the mosquito bite for some minutes. Remove the tape and stand ready with tweezers. When the botfly larva sticks its head out for a breath, pull it out. Or, as we heard from an Indian guide, just leave it alone (a painful thing to do, because the larvae eats away under the skin) and after 100 days when it is fullgrown it comes out via the little hole through which it takes in its oxygen. It drops into the ground and pupates into a fly. In the afternoon we canoed through a cave at Barton Creek, San Ignacio, Belize. Better believe we wore mosquito repellent. 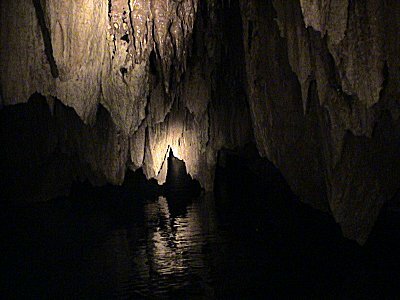 The Mayans used this cave as a ceremonial sacrifice chamber. A human skull lies petrified in the wall. Other Mayan artifacts have been left undisturbed.